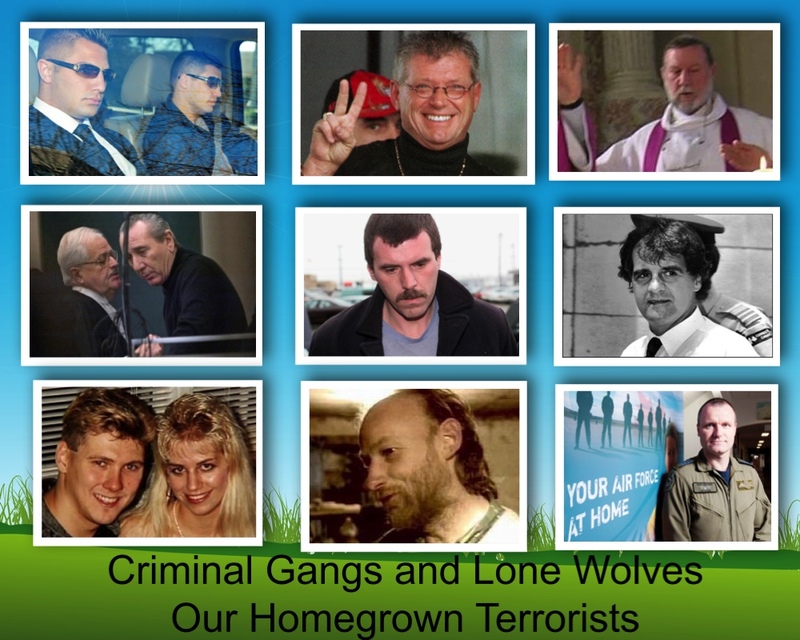 Photo Collage: A few of Canada’s notorious terrorists: The Bacon Brothers (BC), Maurice Bouchard (PQ), Eric Dejaeger (Nunavat), Vito Rizzuto (r)(PQ), Alan Legere (NB), Clifford Olsen (died in prison)(BC), Paul Bernardo and Karla Homolka (Karla served 12 years after a plea deal) (ON), Willy Pickton (BC) and Russell Williams (ON). Note: Just in case a few may think I am a left wing apologist for terrorists, you would be wrong. Terrorists, whether they be of the criminal type or of the religious type, are despicable scum who deserve to be removed from civil society wherever in the world they may seek to practice their murderous ways. What I do not think we should do is give them a platform on which to spread their vile messages, nor should we re-direct billions in scarce funds away from those things that could make a real difference in reducing crime in whatever form it may present itself. The above criminals represent just a small sample of everyday Canadian men and women who have murdered, raped, tortured, molested or terrorized thousands of people in communities across Canada. After these ‘terrorists’ were identified, charged, convicted and locked up, others came on line to replace them. A number of these people are ‘lone wolf’ terrorists who targeted women and children, but the others, the gang types, created large criminal organizations and recruited others (often youth) into their enterprise so they could expand and consolidate their reach. They were and are the Mafia, Motorcycle Gangs, Triads, etc. and they exist in every Province and Territory across Canada. All of the above terrorists were identified and charged using standard police techniques and they were prosecuted under laws contained in the Criminal Code of Canada. Those who organized in groups often maintained a code of silence that was difficult to penetrate and more than a few lone wolves maintained a veil a respectability that made it equally hard to bring them to justice. Even though these people, whether lone wolves or as part of a criminal enterprise were extremely dangerous, we intuitively understood that it is unlikely those who replace them will ever impact our lives as crime in Canada is relatively low and our police, with a few exceptions, do an excellent job of maintaining law and order. Our cities and towns are safe and Canada sits near the top as being among the most safe of nations on earth. On the other hand, we seem to worry a lot about terrorists of the jihad type. Why? Perhaps because our government, government agencies and media constantly tell us they are more dangerous than anything that currently challenges our society; they skulk within our midst; they belong to a certain religious group, and they often dress in a similar same manner. Do any of the homegrown terrorists in the above collage (representing 99,999% of of all criminals) look anything like those portrayed on TV and in print media day after day after day after day for the past fourteen years (the other 0.001%) who are officially known as terrorists in the current worldwide use of the word. No? I wonder why? Join this, the first of a three part series that will explore the Wars we Wage. Note: If you read this post, please consider this question. If 99.999% of all crime in Canada is covered under the Criminal Code of Canada, is investigated by regular police and dealt with in regular courts, why has so much attention, so many new laws and so much money (probably half again as much as directed to all regular law enforcement) been directed to dealing with the .001% who could roughly be defined as a “Muslim or Islamic Terrorist or Jihadist”? On January 29, 2015, the Times Colonist and other media outlets across Canada carried articles along the lines: “Advocating Terror to become a crime.” The Prime Minister told the press this new legislation will be introduced on January 30, 2015 (1) and is intended to target those who are thinking about becoming a terrorist. As I set about preparing other articles on the Wars we Wage, headlines such as these do not surprise me, but the fact media outlets never seem to check the background or challenge the government is disappointing. I had hoped reporters were better than that. 22 (1) Where a person counsels another person to be a party to an offence and that other person is afterwards a party to that offence, the person who counseled is a party to that offence, notwithstanding that the offence was committed in a way different from that which was counseled. (2) Every one who counsels another person to be a party to an offence is a party to every offence that the other commits in consequence of the counseling that the person who counseled knew or ought to have known was likely to be committed in consequence of the counseling. While the word ‘incite’ is often used, Section 22(3) defines “counsel” to include “procure, solicit or incite,” as this broadens the offence to include a variety of other actions. That section seems sufficiently clear and should be able to handle any eventuality that might crop up when one person or a group of people, actively encourages others to become involved in a terrorist act and later, in some manner, that person becomes involved. “But wait”, you might ask, “how do you stop someone from actually carrying out the act.” The alleged VIA rail attack and the Tim Hortons Bombers (Toronto 18) are cases in point. What has always been available is Section 465 of the Criminal Code, that is “Conspiracy to Commit“. The full text is presented in the footer (2). Over my thirty years of policing, we periodically investigated crimes that fell under the purview of both sections and in most cases we were able to interrupt the crimes before they were carried out. In those cases we charged the individuals with ‘conspiracy’ and the penalties applied upon conviction were the same as if the individuals had carried out the planned offence (e.g. murder, robbery, kidnapping, etc). For those who might have counselled others to commit a particular crime (e.g. ask or hired someone to kill another person), they were scooped up and charged as if they were a perpetrator. If you watch the news or read a paper, you may have read of such cases. Why is it when it comes to ‘terrorism’ various governments collectively wring their hands and complain that police and other enforcement agencies lack the tools to deal with specific individuals, with those who aid and abet terrorists and those who encourage others to commit a terrorist act? What is the explanation? The answer is bundled up in the word “fear”. Nothing is easier to sell than fear and every government and government agency gains power when people are led to fear something that is extremely remote such as terror, ebolla, etc. In the present situation, clearly the government (and government agencies) need to justify the billions being spent on the War on Terror, a war that has been waged for nearly fifteen years and could conceivably continue for decades into the future if no one begins to explore alternatives. As every government and government group also needs to be seen as doing a good job, they need to create the right conditions and there is no more simple method than by spreading fear of terror. You might note that in recent years, our War on Terror has largely replaced an earlier “War on Crime”. Terror has become a multi-trillion dollar business around the world, yet in Canada and the Commonwealth, the United States and the countries of Europe, terrorist acts remain a relatively minor problem compared to other pressing issues of the day and terrorism is a very long way down the list. Yet, terrorism always seems to come out near the top. The downside of all this – the more money spent on terror, the less there is available to spend on other pressing problems of the day (e.g. poverty, inequality, health care (including mental health), low income housing, assisting other countries in need, cleaning up the environment, etc.). The list of things we could do with all the money spent on fighting a war against terror, would go a long way towards improving conditions around the world that would make terrorism far less of an issue. As for the latest media reports, a government spokesperson states the new legislation is “stopping short of criminalizing the glorification of terrorism” I suppose a for instance would be posting something on line that supported terrorism or of some terrorist in the act of committing a crime (e.g. that insane ISIS character). Well, of course they better stop short of making it a crime to glorify acts of terrorism for it they did every media outlet across Canada would be in violation every day. How many times have we been force fed videos and photos of those deranged masked individuals preparing to behead an innocent citizen. Single images like that help the government more than a thousand words. The problem, those images also act as the lifeblood of terrorists as it gives them a worldwide platform on which to spew their vile hatred and there will always be a few individuals who will be drawn to that image and what it represents. That the media is an active partner in spreading terror will be discussed in the next article for, without that ongoing help of the media there would be considerably less terror in the world today. That would be a good starting point for re-directing our scare resources to those things which could really help making the world a more safe and secure place. (1) The National Post Bold Headline this morning (January 30) “TORONTO JANE’S JIHAD REVEALED ONE TWEET AT A TIME” is accompanied by a large map of the Middle East. The sub-title is “Researchers follow terrorist sympathizer’s movements from Canada to Syria to Iraq” Now this was no ordinary piece of University Research, but simply an article published by a group called TRAC (Terrorism Research and Analysis Consortium). No names or research detail is provided. Given the content, it seems the ‘research’ originated within some National Security Organization that was tracking various individuals and this seemed like a good one to pass to the press via some third party organization. Read the article, you will see what I mean. The “research” is nothing more than an Editorial written by someone and then re-capped by Stewart Bell an author who occasionally submits to the NP. If you take the time to read the full Post article, as well as other articles on page A4, you will also discern the reason this played out today, that being, “polls on terror show government has support”. Today is the day the Conservatives are introducing more, bold new anti-terrorist legislation. (2) Conspiracy to Commit: I encourage you to take a few moments to read the full text and make your own determination as to whether you think a whole series of new laws is needed to deal with “terrorists”. (b) the exceptions to those requirements, apply to proceedings commenced in any territorial division pursuant to subsection (5). I agree, the media has, can and does provide platforms for terrorists and criminals alike. These days terrorists use the media like marketing and recruiting tools. On the other hand, who can forget the role the media played in turning John Gotti, into a.k.a. the “Teflon Don” or the “Dapper Don” a celebrity.